A pingback security bug exists in the Wordpress blogging platform may be exploited to launch distributed denial-of-service (DDoS) attacks, according to web application security firm Acunetix. The vulnerability is exploitable through the platform’s XMLRPC API (through XMLRPC.PHP). 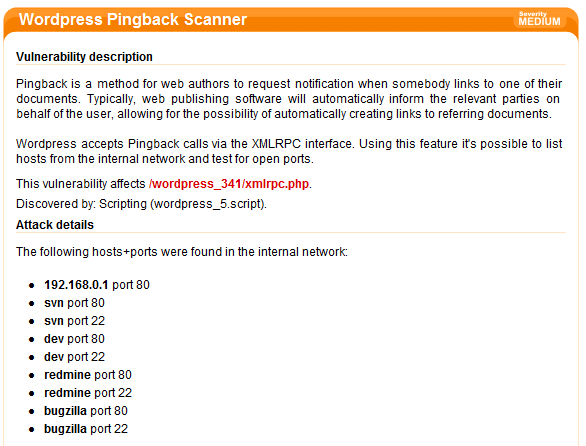 A malicious hacker can spoof a pingback to a specific blog in order to guess hosts inside each network they target, port scan those hosts, reconfigure internal routers or simply launch DDoS attacks. The team successfully implemented an Acunetix WVS script to test this security flaw. This script will try to resolve various common internal hosts and try to connect to common ports. In the end, it will report the successful attempts.